We tend to avoid hot dishes like this in the summer time which is a bit silly really as they eat tagine all year round in Morocco which is usually hotter than Dublin whatever the time of year. Marinate the lamb up to 48 hours in advance, if you can, to maximise the flavour. Serve with herby couscous or bread. Wine Suggestion: It was a hot day when we made this dish so we took inspiration from Spanish winemakers and chilled a red wine for 30 minutes and were delighted we did. Our choice was Massaya’s le Colombier from the Beqaa Valley in Lebanon, a wine we find naturally pairs with Middle Eastern, North African and Spanish cuisine effortlessly. This is a winery really on the up and we think each new vintage is better than the last. Mix the marinade ingredients together in a large bowl, then add the lamb and mix until coated. Cover and leave in the fridge overnight or for up to 48 hours. Heat the oven to 150C/130C fan/gas 2. Put a large casserole over a medium heat with 1 tbsp of oil. Sauté the onions for about 10 minutes or until softened but not coloured. Add the garlic and ginger for the last 3-4 minutes. Meanwhile, heat 1 tbsp of oil in a large frying pan and put over a high heat. Add the lamb and brown all over. Pour half of the stock into the lamb pan to deglaze then transfer everything to the casserole with the onions. Add the passata or tomatoes, the rest of the stock, saffron and soaking liquid, dates, sultanas and most of the pistachios. Season with salt and black pepper. Bring to the boil, cover with a lid and cook in the oven for 2-2½ hours until the meat is very tender and the sauce thickened. Serve sprinkled with chopped mint and the rest of the pistachios. 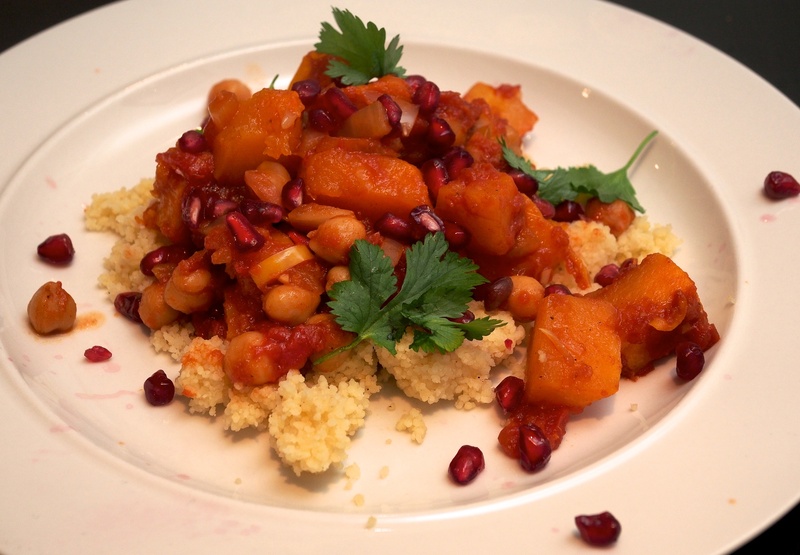 An easy casserole with North African spices and fruit. Suitable for cold nights in as well as entertaining good friends – which we have been doing lots of due to snow days. Serve with plain couscous or with Golden Couscous and Shirazi salad. Wine Suggestion: A guest brought over a Roda Sela from Rioja, which had juicy red fruit flavours to complement the spices and a polished, refined finish. Preheat the oven to 170C/Fan 150C/Gas 3. Put the lamb into a large mixing bowl, then tip in the spices and mix well with your hands. Peel and grate the onions (you might like to use a food processor if you have one to save your eyes). Peel and chop the garlic, then crush with the salt using the back of your knife. Put a large frying pan over a high heat and add a tablespoon of oil. When the oil is hot, add a quarter of the lamb cubes and cook until browned all over. Remove with a slotted spoon into a large casserole dish. Brown the rest of the lamb in batches, adding another tablespoon of the oil each time. When the meat is all browned, turn the heat down to low and add the last tablespoon of oil, then stir in the onions and garlic. Cook for about 10 minutes or until softened but not browned. Add the lamb stock to the onions and stir to scrape any crusty bits from the bottom of the pan. Pour the onions and stock over the lamb, then add the remaining ingredients. Bring the casserole to the boil, then cover and cook in the oven for 2 hours or until the lamb is completely tender. 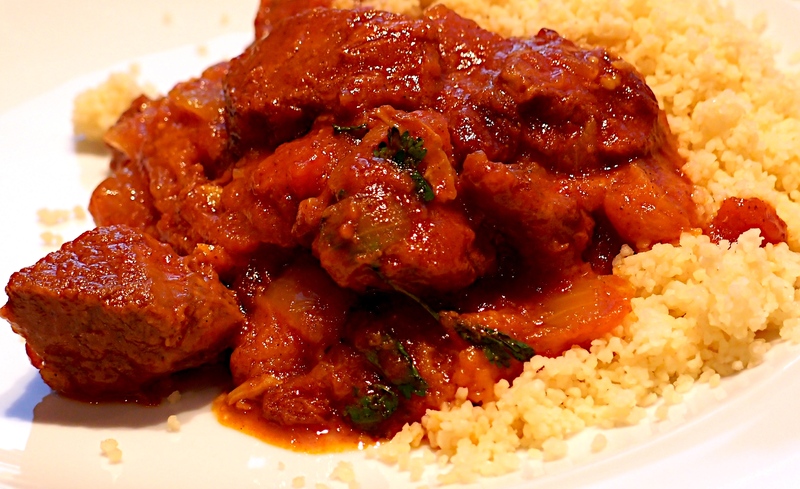 This is really tasty and aromatic and much quicker to prepare than most tagine. You can serve with some plain buttered couscous but the Golden Couscous below is particularly good and the two brightly coloured dishes look fab when served in a bowl and scattered with fresh herbs. Wine Suggestion: we love the wines from Lebanon as they tend to go well with the cuisine of the Middle East and North Africa. For this dish we opened the Massaya Terrasses de Baalbeck, a blend of Grenache, Mourvedre and Syrah from the slopes of Mount Lebanon, above the Temple of Baalbeck. Earthy spice and pure, it provided a nice lift to the drizzly days we’ve had recently. Preheat the oven to 150°C/300ºF/Gas 2. Put the oil and butter into a large casserole dish over a medium heat. When the butter has melted, add the onion, garlic, ginger and chilli and cook for 6-8 minutes or until starting to turn a light golden colour. Stir in the turmeric, 1 tbsp of the lemon juice and half the chopped coriander. Add the tin of tomatoes and the sugar, then bring to the boil. Lower the heat and simmer with a lid on for 10 minutes. Meanwhile make the kofta by placing all of the ingredients into a large bowl and seasoning with salt and black pepper. Mix together well using your hands, then roll into about 30 small balls. Carefully lower the koftas into the pot with a spoon and gently roll them to cover in the sauce, then cook in the oven for 20 minutes. Season to taste, then stir in the remaining lemon juice and sprinkle with the chopped mint and coriander. This was tasty for a mid-week veggie night. The pomegranate molasses add a pleasant sour note but if you don’t have any you can substitute a few tablespoons of lime juice and a teaspoon of soft brown sugar drizzled over the top. Put the squash onto a baking tray, drizzle with 2 tbsp of the oil, season and toss to coat evenly. Roast for 25 minutes or until soft. Put half the squash into a medium casserole dish and set the rest aside. Heat a medium-sized frying pan and add the rest of the oil, then the onion, garlic, ginger, chilli and paprika. Cook for 5-8 minutes or until the onion is soft. Add the tomatoes, pomegranate molasses and chickpeas, then simmer for a minute before turning off the heat. Pour half the tomato sauce over the squash in the casserole dish in an even layer. Arrange the rest of the squash on top then finish with the rest of the sauce. Cover with a lid, transfer to the oven and bake for 25 minutes. Remove the casserole from the oven and serve hot or at room temperature, scattered with chopped parsley, pomegranate seeds, and mint, with the yoghurt on the side. Serve with couscous. This dish couldn’t be easier and the sauce is delicious. 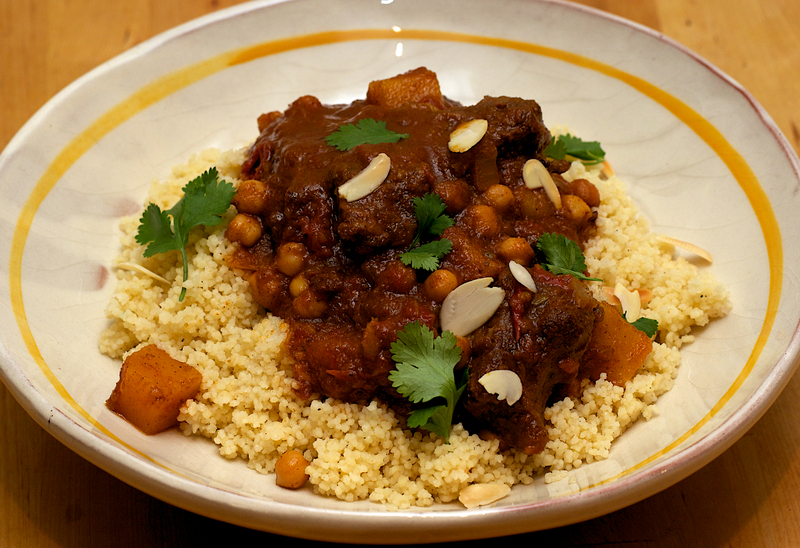 It can be made in an authentic tagine if you have one, or alternately in a large casserole dish like we used here, both work well. Serve with couscous and natural yogurt. 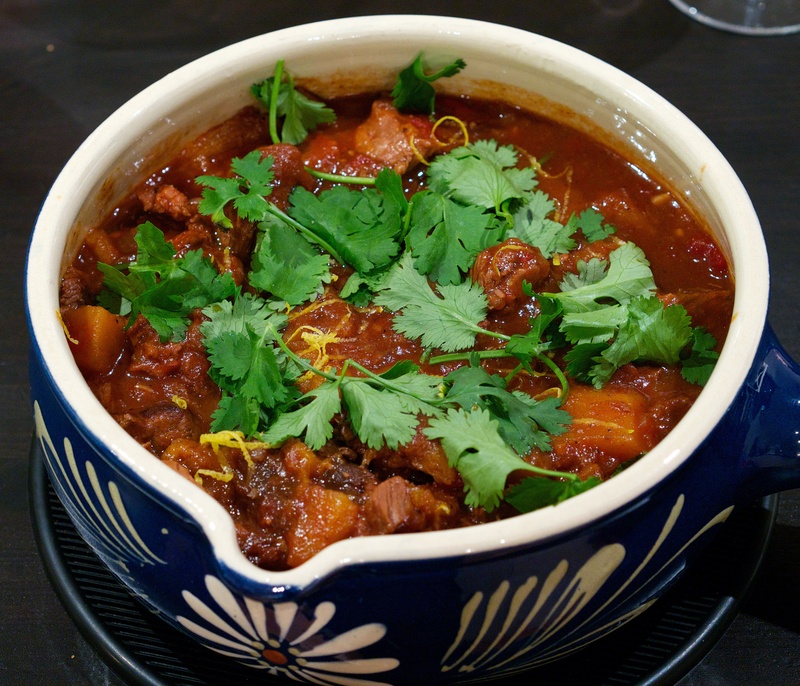 Wine suggestion: With all the spice and richness in this dish the best wines to match the tagine are medium to full-bodied reds with a juicier fruit like a Ribera del Duero. Our pick of the moment is the Condado de Haza Crianza 2011 which has a lovely, open and approachable nature whilst hiding a core of real depth, texture and personality. We’re sure this wine will age really well if you like but suspect most will be consumed soon after purchase; very moreish! Heat the oil in a flameproof casserole, add the onion & cook for 5 minutes until softened. Add the garlic and spices, and cook, stirring, for another couple of minutes. Stir in the lamb, squash and apricots, then add the tomatoes and stock and season well. Bring to the boil, put the lid on and transfer to the oven. Stir after 1 hr and return to the oven, uncovered, for another 30 minutes. Check the seasoning and sprinkle over the lemon zest and coriander to serve. The quintessential Moroccan dish, which you don’t actually need a funny shaped pot for. We cooked this back in April when it looked like Spring, and the prospect of lighter dishes, was never going to arrive. Serve with lots of couscous (or bread if you want to be more authentic). Mix the spice rub ingredients together in a small bowl. Put the beef into a large bowl, massage it with the spice rub, then cover and leave in the fridge overnight (or for as long as you have). Heat some olive oil in a heavy-based casserole and fry the meat over a medium heat for 5 minutes. Add the onion and coriander stalks and fry for another 5 minutes. Add the chickpeas and tomatoes, then pour in 400ml of stock and stir. Bring to the boil, cover and reduce to a simmer for 1½ hours. Add the squash, prunes and remaining stock and continue to cook for another 1½ hours. You might need to add a splash of water if it starts to dry. If the tagine looks to runny you can simmer for 5-10 minutes with the lid off to thicken. Taste and season with salt if needed. Serve scattered with the coriander leaves and toasted almonds. Jono liked this so much he swears that if he’d been on his own he would have scoffed the lot! The combination of lamb shoulder, spices, apricots and preserved lemons give this dish such richly and multi-layered flavours that are all exceptionally well balanced and moreish. Make the most of fresh apricots while we can get them! This needs time to marinate which will add even more depth of flavour and tastiness, but if you forget even a short marinating time will still give a very nice result. Mix ground spices thoroughly together then toss lamb in half the ground spices and leave for at least 4 hours, but try to marinate from the night before (we didn’t read the recipe properly so didn’t marinade it at all and it was still fab!). Heat oven to 160C/Gas 3. Warm olive oil gently in a deep, heavy-based casserole and add seasoned meat in small batches; brown on all sides and then remove. Next add the onions and garlic with the remaining spices and soften, stirring regularly. Add a little more oil if it dries too much because of the spices. Be careful to moderate the heat as you don’t want to burn the spices. Add sultanas, honey, saffron, stock, tomatoes and whole apricots and then return the meat to the pan. Bring to the boil, season with salt and black pepper, cover with a lid and place into the oven. Remove tagine and stir in the preserved lemon. Lift meat out with a slotted spoon and boil sauce over a high heat until reduced and thick. Return meat to sauce and stir in the coriander and mint.